Promote your company or your favorite cause, show your support for the arts, and help us bring in more amazing artists. We can even design an ad for you. We accept ads for our Concert Series program, our bimonthly newsletter, and our midsummer Folk Festival program. Click a button below for all the info: deadlines, pricing, artwork details, and whom to contact with questions. Held the last weekend of July, the Susquehanna Folk Festival is a full weekend of live music, dancing, workshops, crafts, storytelling, and more. 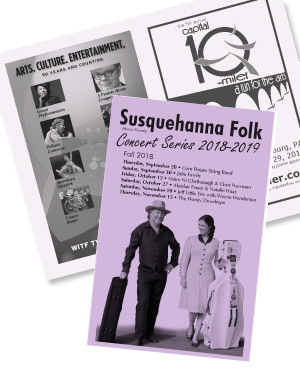 The online edition of the festival program is full color; the printed version features full-color cover ads with black-and-white interior ads. Our newsletter, Central Pennsylvania Traditions, is published five times a year and reaches over 2000 electronic subscribers as well as visitors to our eNews portal. It is also distributed in print form. We can accept non-commercial advertising for the newsletter.